(15/P68) TRENTON – The Christie Administration is sending New Jersey Forest Fire Service crews and equipment to assist in the battling of wildfires that are raging across parts of the Pacific Northwest, Department of Environmental Protection Commissioner Bob Martin announced today. 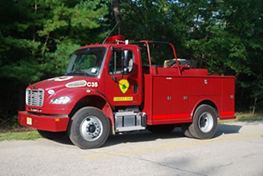 The Forest Fire Service is dispatching a total of 32 firefighters and three wildfire trucks, known as Type 4 engines, which are specifically equipped to pump water in remote fire areas. These resources are being sent to fight wildfires in Oregon, Idaho, and Montana as part of a cooperative aid agreement with the U.S. Forest Service. Twenty full-time and part-time employees of the New Jersey Forest Fire Service are flying out tomorrow. Three left yesterday. The three wildfire engines are leaving this afternoon, each with a three-person crew. They are driving to the fire scenes. The U.S. Forest Service has provided resources to New Jersey in the past to assist in clearing of downed trees resulting from major storms, most recently after Superstorm Sandy knocked down countless trees in October 2012. Fire crews are being sent to a staging area in Missoula, Montana for assignment. The Type 4 engines are being sent to the National Creek Complex fire in the Rouge-Siskiyou National Forest in Oregon. All personnel assignments are expected to last two weeks. The engines will remain as long as needed, with crews rotated as necessary. The Pacific Northwest isn't alone in its battle with wildfires. In fact, wildfires had burned 5.5 million acres in the U.S. by the end of July, an area exceeding the size of New Jersey. Alaska has taken the biggest brunt of the fires. Eighty-five percent of the acres burned in the U.S. this year have been in Alaska – a total of 4.7 million acres. A fire in Glacier National Park in Montana has burned 11,400 acres. In California, 9,000 firefighters are battling 24 wildfires, leading to a state of emergency there.